Quick and easy to make, grilled sandwiches are big on nutrition and flavor. Whole grain breads filled with fresh vegetablesand melted cheese make a typical any time snack . This delicious sandwich cooks up hot and toasty on the grill in no time. Vegetable grilled Cheese Sandwich is easy to make and very filling .Also a great way to include some vegetables in your daily diet! 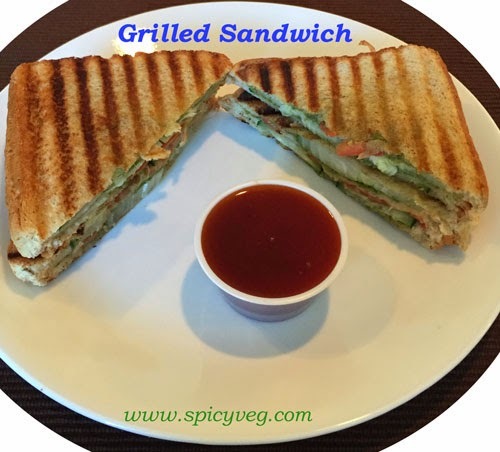 Vegtable grilled sandwich is a must try Enjoy with tomato ketchup. 1.Cut the onion, tomato and cucumber into round slices. Set aside. 2.Take the bread slices and apply butter on 1 of the slices and coriander chutney on the other slice. 3.Place an onion on top of the bread slice,then place the tomato and cucumber slices . 4.Sprinkle grated mozeralla cheese and pepper on top. 5.Place the buttered slice on top [with the butter side facing up] to close the sandwich. 6.Heat a grill medium heat. Once hot, place the sandwich on the pan with the buttered side facing down. 7.Apply some butter on the slice that's facing upwards now. 8.Close the grill lid and grill the sandwich untill the nice golden grill marks appears. 9.Serve hot with Tomato sauce or with green chutney.